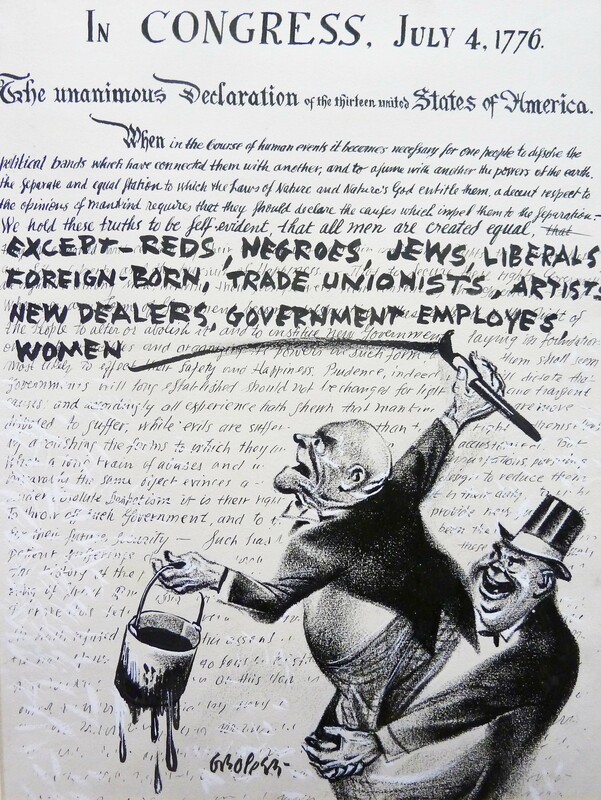 William Gropper’s art offers a lasting lesson in how useful pencils and paintbrushes can be in the fight against the exploitation of the many for the profit of the few. A few weeks ago I spoke to a class of 12th-graders in a Brooklyn public school about what it’s like to be a journalist. The students were curious about whether my life had ever been endangered while reporting a story (no), whether anyone had ever gotten angry with me for asking unwelcome questions (yes), and whether any journalists have become rich and famous (yes, but not often those who ask unwelcome questions). They were especially interested in the idea of telling stories with images, not words. One, an adept at Instagram, had never heard of photojournalism, and was intrigued. Two other students said they were into painting and drawing, but I somehow didn’t think to tell them that some of the most exciting and subversive American journalism has taken the form of illustration. 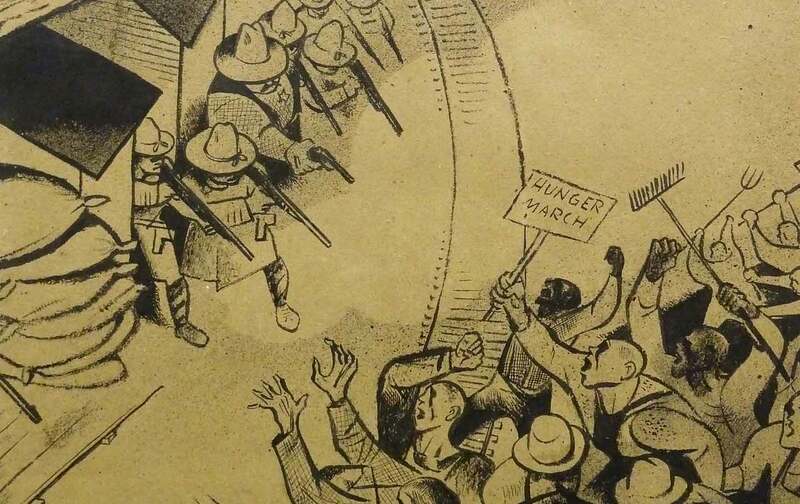 Had I visited the Queens Museum’s current exhibit of drawings by William Gropper before my classroom talk, I wouldn’t have made that mistake. Gropper was born to a pair of immigrant Jews on the Lower East Side in 1897. His father, Harry, had studied in several European universities and learned eight languages before immigrating to New York and finding little to do with his learning. He finally got work in a garment factory, where he met Jenny Nidel, also a new arrival. “The sweatshop gave us our livelihood but robbed us of our mother,” Gropper later recalled. (He once said that unlike Whistler, who famously depicted his mother as a solemn and dignified stoic, he would have painted his own as bending over a bathtub or a sewing machine.) Gropper spent his childhood getting pummeled by various gangs and drawing sidewalk pictures of cowboys and Indians that wrapped around the block. In 1911, a favorite aunt perished along with 145 other workers, most of them young Jewish women, in the devastating fire at the Triangle Shirtwaist Factory in Greenwich Village. To say, as the museum does, that Gropper “was exposed to the rigors of the working class at a young age,” severely understates the point. In our eagerness to draw parallels between then and now, we often avoid the actual similarities and differences. One Depression-era poster by Gropper declares: against capitalist terror: against all forms of suppression of the political rights of workers. That now-neglected word, “suppression,” often appears in Gropper’s work, and as far as words go, it is, as the current leader of the Republican Party might say, one of the best. It appears again in a late 1930s drawing that, to my mind, offers a far more compelling visual metaphor for entwined grievances and social causes than the currently fashionable idea of “intersectionality.” Gropper’s drawing has a single tree with several of what the accompanying panel calls “negative influences” branching out from it: “war profits,” “race hatred,” intolerance, Charles Coughlin, “anti-labor propaganda,” the collusion of Franklin Delano Roosevelt and FBI director J. Edgar Hoover. Gropper called the drawing suppression. In his mind all of those scourges are connected at the roots. By contrast, intersectionality asks us to think of lines that meet only for a moment, before again going their separate ways. After the rise of Hitler, Gropper took a different tack. “Gone were the former diatribes against kosher businessmen, imperialistic Zionists, and rabbinical fakers,” Gahn wrote. “Gropper’s childhood sufferings shared with thousands of other Jews on the East Side seemed at last to have emerged as a strong feeling of brotherhood in the face of Hitler’s horrible persecutions.” In “Warsaw Ghetto,” published in a Jewish monthly called New Currents in 1943, Nazi toughs hassle women and children forced to march along in a line; in another picture, the same three goons haul off a looted Torah and menorah from a pile of burning bodies. The current exhibit includes a Yiddish book with the artist’s name on the cover, spelled out in Hebrew letters, right to left. Explaining his postwar works showing rabbis’ hands plaintively reaching up to the sky, Gropper described himself as “not Jewish in a professional sense but in a human sense”—yet another salient distinction we appear to have all but lost. In our eagerness to draw parallels between the present and the past, we often avoid discussing the actual similarities and differences between another time and our own. There is a tendency to do this on the left nowadays that is directly related to—indeed, probably proportional to—the active suppression of dissidence in the United States for the last 75 years. The results are both gestural politics and unsatisfying art: revolution as a marketing campaign and presidential campaigns that call themselves revolutions. In his classic 1961 study Writers on the Left: Episodes in American Literary Communism, the scholar Daniel Aaron, who died on April 30 at the age of 103, quoted Gropper, writing in New Masses, about the vigil he kept with Edna St. Vincent Millay, John Dos Passos, Dorothy Parker and others on the night that the Italian anarchists Nicola Sacco and Bartolomeo Vanzetti were executed by the state of Massachusetts. Together, they watched as the “two black hands of the death clock” approached midnight. “Soon on a board near us appeared the words, Sacco, Vanzetti Dead,” Gropper wrote. “Then nothing mattered, nothing except the morrow…for I knew the workers would remember.” As it turns out, they could use some help.